Morsel munchers might like to have a look at the Troppo Armadillo weblog, which offers "Musings on law, politics, society and life from blogdom's cross-disciplinary post-moral majority". Included are several discussions on topics of particular interest: Fractured Communion? and Pell Pot's 'democratic' vision. Gripped with Easter fervour, Prindiville and Sudla have this week indulged themselves in a little church redecorating. Their redoubtable DIY skills may be admired, not so much on the wall behind the altar where they focussed their attention, but in the paint splashes and smudges on the sacred Kiko carpet, and even, to Naoami Myers chagrin, outside the church on the Aboriginal Medical Service's path and plants. Appropos of which, have you heard the one about the church painter? A painter had just finished painting the interior of a church and was getting ready to pack up and leave, when the parish priest came out and asked him to also paint the exterior. The painter agreed to do so, but soon realized that he did not have enough paint to finish the whole job. He also realized that if he thinned out what he had left he might just be able to do it. Anyway, he completed painting the outside of the church, when a sudden rain storm came out of the clear sky. The rain fell only on the church, washing away all the still wet paint, and a voice boomed out of the sky.... "Re-paint you thinner!" It would seem that Neocats, like many other creatures, are predisposed to marking out what they consider to be their territory. Time and time again our pastors have insisted that St Vincent's is not a Neocatechumenal Church. 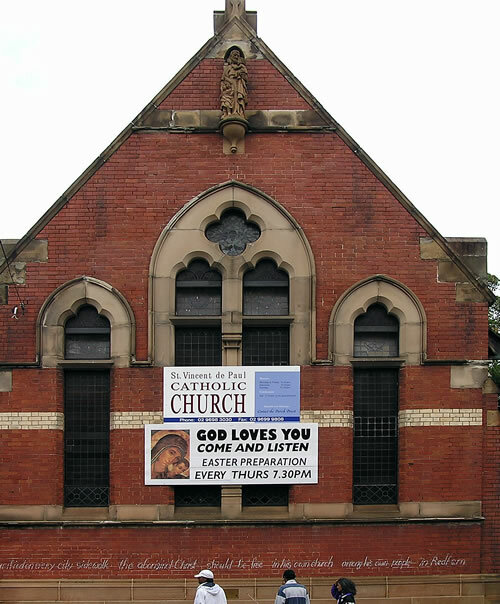 Last week a large sign was fixed to the Redfern Street facade of the old church, emblazoned with Kiko's Madonna, the unmistakable sign of the Way [see Icons of the Neocatechumenal Way]. The community had not been consulted. Back in April 2004, a carpet appeared beneath and behind the altar, without consultation and to the consternation of the community. A very similar carpet is to be found in the Good Shepherd Parish in Kelmscott Perth Western Australia. Earlier this month (February, 2005) Fr Eric Skruzny officiated at a 10:00am Sunday mass at St Vincent's. After mass he was asked about the significance, if any, of these carpets and their design to the Way. Fr Eric adopted the familiar Neocat ploy of speaking without answering the question, even managing to slip in a criticism. We have been uncharitable, he chastised, in our criticism of our pastors, but would not be drawn on the issue of their uncharitable behaviour towards the community, especially the Aboriginals in the area who feel they are treated as lepers by the Neocats. He also declined to talk to us about the Neocatechumenal Way; his parting words were - "I am not a spokesperson for the Neocatechumenates". Fr Eric Skruzny is the inaugural rector of the Pagewood, Sydney Redemptoris Mater Archdiocesan Missionary Seminary; he was previously vice rector and dean of studies for Perth�s Redemptoris Mater Seminary, the first in Australia, when it opened in 1994. For more than 3 decades St Vincent's Church, Redfern has offered comfort to grieving Aboriginal families who came, far too often, to bury their loved ones. On Friday, 4 February 2005, Fr John Ford officiated at the first Aboriginal funeral held at St Vincent�s since Ted�s departure nearly 3 years ago, leading us in a poignant ceremony in true Aboriginal style. Within a week we had the funeral of a young Aboriginal woman, Michelle Riley. Again several hundred people poured into the Church in response to a young life that had poured out so much love. Again Fr John Ford officiated. Many expressed gratitude to be coming home to the old Church. May the doors of St Vincent's never again be closed to Aboriginal people. Which parish priest blew his stack on Monday morning because he felt that the church was in such a mess he couldn't say mass there, and would not do so until it was tidied up? Probably the same one that angrily declared there would be no more Christmas parties for the poor in "his" church, or the one that was too busy "having his lunch" to discuss what on earth he was on about. The rear of the church beneath the choir loft was decorated, and hampers, donated by numerous Sydney parishes, were carefully arranged at the other end of the church after Sunday's mass, in readiness for Tuesday's Sharing the Meal Christmas mass and luncheon. In deference to the parish priest, the volunteers placed the 200 or so Christmas hampers [photo 1, photo 2] out of the way, even though the average priest would have been overjoyed with such an offering to the poor around his altar. This extraordinary outburst left the already over-stressed Sharing the Meal organisers uncertain not only about the planned mass, but even whether they would be permitted to use the church at all for the special function. Thank God that some semblance of sanity prevailed on the day, and Gerry turned up to say the 9:00am mass for a congregation of 25 or 30. Gerry's assistant Dennis Sudla was in the congregation. After mass, as he left the sacristy, he was confronted by the elderly, irrepressible Jack Callaghan, who asked "And when are you going to apologise to Marnie and the other women of the parish that you have abused?" Sudla glared at Jack, twice spat some unintelligible words at him, then used his finger to make an obscene gesture before heading past the altar. Jack followed with more questions, whereupon Gerry intervened, angrily stamped his feet on the floor and told Jack that it was none of his business. He then grabbed Sudla by the arm, insisting that they leave. Len De Lorenzo, standing nearby taking photos of the hampers, witnessed the entire performance, and followed the unruly procession with his camera. He too was treated to Sudla's single finger salute as these noble pastors left the church premises. Is "listening" an area of your relationship where you'd like to develop better skills for yourself? Would you like to experience a deeper level of being listened to by your spouse? A marriage Encounter weekend gives you the opportunity to explore your listening behaviours. Perhaps the community would like to consider taking up a collection to pay for GP and DS - not to mention some of their mates further up the hierarchy - to explore their listening and relationship skills? "Every day people are straying away from the church and going back to God." Moved to the Neocriticism page. Some excerpts from the minutes of the National Council of Priests Meeting in September. There was ongoing concern about reports of the lack of pastoral sensitivity by the Neo-Catechmenate priests at Redfern. There was particular concern about the decision to discontinue provision of a weekly meal and the withdrawal of the payment of $220 per week from the CWF that assisted outreach to the poor and needy of the community. Several parish communities in the Deanery have been supporting various initiatives at Redfern and the concern was widespread. There was a perception in the Catholic community that considerable funds were available to promote certain issues, to employ staff and to set up new agencies in the Archdiocese but no funds were available to continue support for those in need. most who attended mass there were from outside the Redfern area. The church was packed today for the 10am mass. Had all these people come to express solidarity with the St Vincent's Community? Well, not quite. Social Justice Sunday was totally ignored by our parish priests. Instead, scores of Neocats were bussed in from near and far for a "Parish Feast". There were even mini-buses from the ACT and Victoria. Last Sunday, in an underwhelming gesture of inclusivity, Gerry issued a vague Clayton's invitation to the Community to attend a picnic after mass to celebrate the feast of St Vincent de Paul, at the same time declining to provide any information regarding time, location or catering. It would seem that Gerry's Neocat rent-a-crowd had access to the details well in advance. The priest and he alone decides if the prayers of the faithful are to be opened up to the congregation and he decides when the prayers are to be concluded. There is no right to publicly express your own private prayers at Mass. Whenever you are invited to pray it is not necessary to give explanation or introductions to your prayer. God knows what you are praying for. The prayer need to be brief and to the point. This is now the practise[sic] in this parish irrespective of what has happened in the past. First the Nazis went after the Jews, but I wasn't a Jew, so I did not react. Then they went after the Catholics, but I wasn't a Catholic, so I did not object. Then they went after the workers, but I wasn't a worker, so I did not stand up. Then they went after the Protestant clergy, and, by then, it was too late for anyone to stand up. The only thing necessary for the triumph of evil is for good men [people] to do nothing. John Crothers, parish priest of St Declan's, Peakhurst and Penshurst, in southwest Sydney has bravely spoken out against Pell's leadership style in a letter to Online Catholics last week. The letter from which the following paragraphs were taken may be read here. The fundamental problem with this sort of conservative leadership style is that it is exclusive and inflexible. Its exclusiveness expresses itself in an "us and them" mentality. I think this is one of the main reasons for the current low morale among the Sydney priests. Many feel that they are "on the outer" because their model of church does not correspond to the highly conservative model that is being pushed at the moment. The inflexibility of this particular model of leadership is expressed in the way the institution is seen as more important than the people in it. The gluten-free host issue is a typical example. I simply cannot understand how bishops can argue that this is what Jesus would want. Jesus' way of ministering was anything but rigid and institutionalised. He focussed on people, rather than laws. In particular he was always inclusive, rather than exclusive. I feel that many of our Church leaders need to reassess the current model of Church leadership in the light of Jesus' own style of leadership. The issue was also taken up by the Sydney Morning Herald with articles on Monday and Tuesday. Let us pray that more of the good men out there find the courage to make a stand with Fr John. The scriptures suggest that a balanced relationship between faith and its expression in good works might not be such a bad thing. The Church Mouse is not sure that Dennis (water is a symbol of death) Sudla agrees. Sudla loudly proclaimed in his homily that faith without works is dead, but good works without faith - i.e. working for social justice and the poor - are doubly dead. Various members of the community walked out of the church in disgust, while others interjected, objecting to this blatant attack against Ted Kennedy's legacy and the community's values. On the other hand, the Neocats in the congregation were appalled at the intense display of antipathy towards THE PRIEST, to whom unconditional respect and obedience is due. Later during the Mass, Sudla graciously allowed extra time when his attention was drawn to the fact that the faithful had a few more prayers than he was initially prepared to tolerate. (PS: according to the hyperdictionary: Antipathy - [n] the object of a feeling of intense aversion; something to be avoided; "cats were his greatest antipathy"
Yesterday's announcement that Sydney's second Catholic university - the University of Notre Dame - is to open at St Benedict's on Broadway was attended by the likes of George Card Pell, Brendan Nelson, Mon Brian Raynor and the Prime Minister John Howard. The Church Mouse's observers noted food tables at the reception laden with wine and snacks. There is apparently no shortage of money to feed the rich and powerful. It's been a hectic week trying to keep the mouse house in order with St Vincent's in the spot light - two ABC radio programs, articles in the online Catholic media and a swag of emails. Over 700 visitors, viewing on average 5 web pages each, have come here since Sunday. If you missed the fuss, here are transcripts of Radio National's Encounter and The Religion Report. Responses to the broadcasts, especially the news revealed on the Encounter program that the Sydney Archdiocese Charitable Works Foundation has withdrawn its meagre funding of the community's Sharing of the Meal may be found here. Incidentally, 180 people were fed at last Tuesday's meal. In the U.S., Roman Catholics have plenty of problems caused by Roman Catholic priests selling out to clericalism. The situation at St. Vincent's, however, surpasses the worst U.S. parish mess. In fact, in the U.S. the worst clericalism results in the closure of the parish and the sale of the church buildings. The land under most urban U.S. Roman Catholic churches has usually appreciated greatly in value. It would be very unusual in the U.S. for so much effort to establish a community, Neo-Catechumenate, that a diverse group of people, racial and social, have no interest in joining. Why bother, why not just close the parish and sell off the property? Would the selling off of the property of St. Vincent's, Redfern be too obvious a real estate windfall for the Sidney Archdiocese? I think such clericalism results in dead ends. To quote Mum Shirl: "My Grandfather always liked to travel in a straight line. He stayed away from the white folks' roads and railway lines, for he said to follow them was the fastest way to end up lost." I'd like to correspond by e-mail with anyone in Australia seriously interested in promoting Mum Shirl's story and her faith in Mad Roman Catholicism. Perhaps, it is time to spread her story beyond the continent of Australia. The witness being supressed in not just that of the community of St. Vincent's, Redfern. The witness being supressed is the presence in the Communion of Saints of Shirley Smith. An Australian who was visiting San Francisco in late March 2004 referred me to some Australian Roman Catholic web sites. It seems fanatical clericalism is causing similar problems in all countries where two conditions exist. The majority of lay Roman Catholics have access to continuing education, and the clerics not the laity own the Roman Catholic church buildings. Arguments about the direction of the Roman Catholic Church then unfold. In April 2004, I came across your web site and was astounded by Shirley Smith's picture. What a memorable face! Only recently I found that Redfern had been the site of significant aboriginal riots in Feburary 2004. Coincidentally, Mum Shirl had an adult older brother, Jimmy, who died impaled. He fell from a veranda while sleep walking. As Mum Shirl said, "I can still listen when it helps, and I do, and I can still learn, and I do that too." Maybe she's still listening. Bet the entire church of St. Vincent de Paul on Mum Shirl.